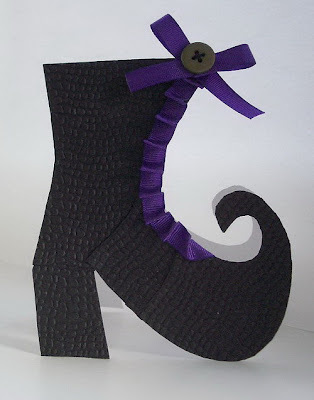 Thought I was done with Halloween cards but when I saw this witchy boot template I just had to make it, although I can't remember exactly where it's from now, think it might be Papercrafts. The Dark Side - we want to see anything spooky, creepy and Halloween-ie on your cards. Apparently mock crock boots with purple trim are a must-have for Halloween '09 ! ;). ICS time again, really enjoyed working with the sketch this week, thanks to Dawn for another inspirational sketch. Pleased to have another xmas card done and dusted too. I used some cheap kraft coloured luggage labels to make the tag and mount the alphas. I do like making something out of a bargain buy. 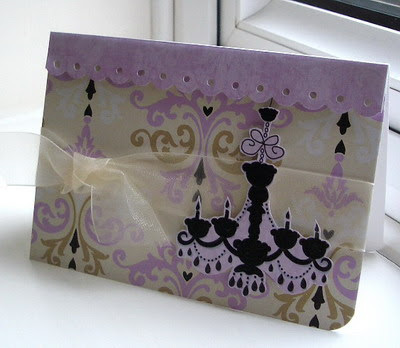 Our sponsor this week is Scrapbooks and Stuff with these fabby designer papers going to the lucky winner. The DT have done us proud again, go check them out and see what you think. First time on the Winter Wonderland challenge for me but it sure won't be my last with christmas fast approaching. 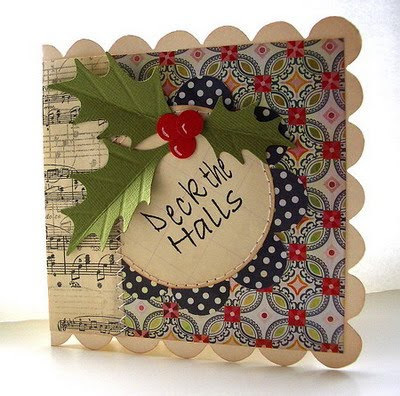 The theme this week is, 'Sleigh Bells Ring'. 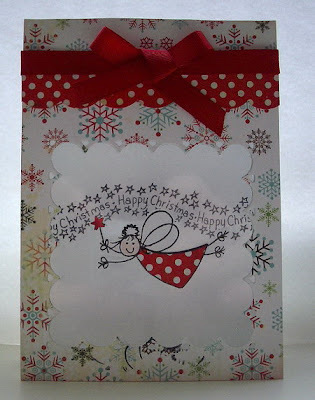 There's a sketch for the Polkadoodles challenge this week, and a lovely one at that, nice and simple, just what I like, and some fab ideas for using it from the DT too. 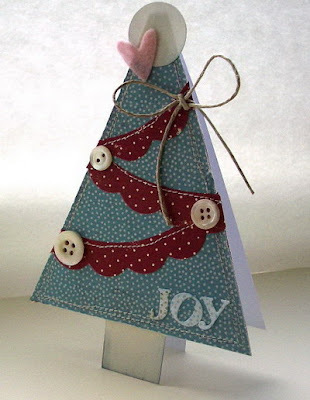 I've used the Sugar Birdies cd for my cards, the first card is for the challenge the second card I was just using up the leftovers! In true Polkadoodles style I played around with some doodling. 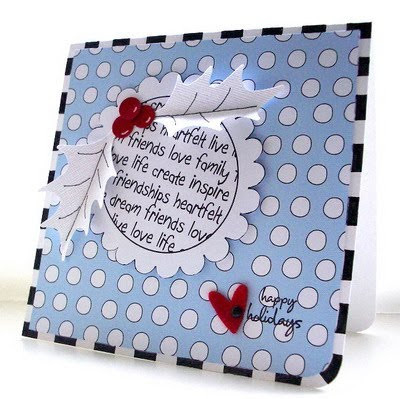 Enjoyed it so much I made another card (not following the sketch) with the rest of the A4 sheet and stampies. 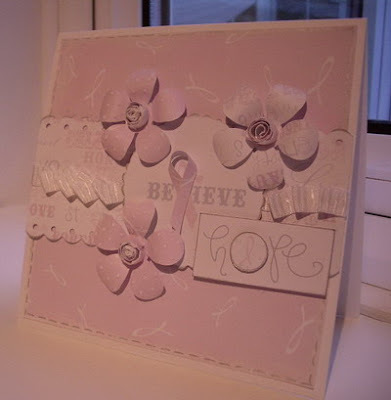 I've seen Nikky on Create & Craft demoing her new stamps, stamping black on pastel papers, and just had to give it a try it looked so effective, something I never would have thought of doing. 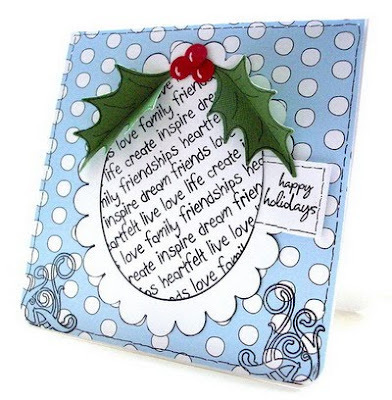 The gorgeous holly leaves and berries are from Lynda, I've doodled on them too! Yet again another brilliant sketch from Dawn at ICS. Another great sponsor too, My Creative Classroom. 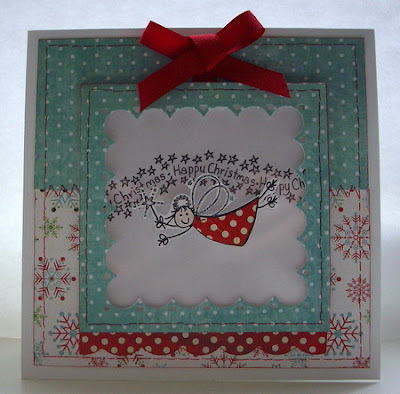 We have some new designers joining the DT this week be sure to check out their beautiful cards. I'm really delighted that Dawn asked me to stay on for another four months as I love her sketches. This card combines two challenges. 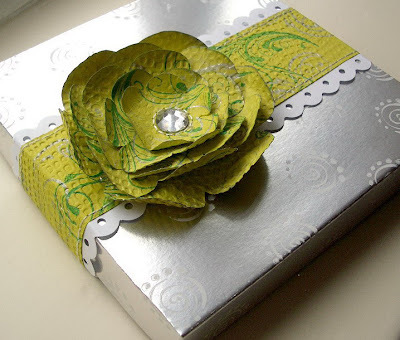 The Allsorts challenge is to use the colour 'Kraft' and the DCM challenge is 'Folding Up'. Allsorts is sponsored by Liz from Pink Petticoat this week and if you use PP products you can enter your card into the draw twice! 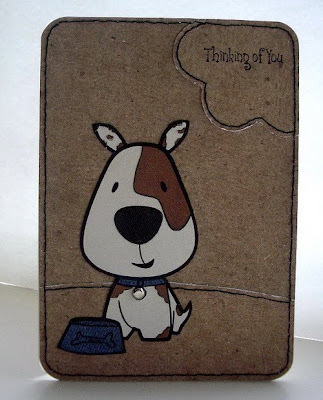 I got the method for this popup card from HERE, it folds flat to fit into an envelope, genius! 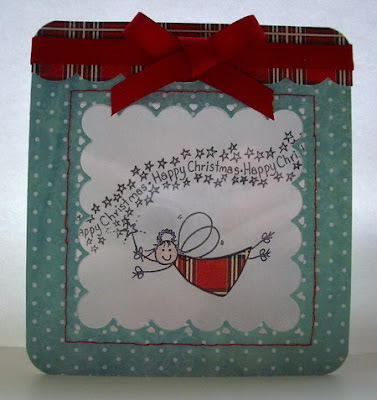 It took a long time to come up with this one, a week in fact, lots of paper shuffling, I was just about ready to throw in the towel, admit defeat and sell all my crafty stuff on Ebay! But after a few hours at the hairdressers yesterday covering the grey! I felt a lot better, finished this card and everything started to fall back in to place. There's two things I'm fearful of at the moment colouring images and embossing, and I was determined to overcome one with this card, and I went for the embossing and I think I've conquered it for now. 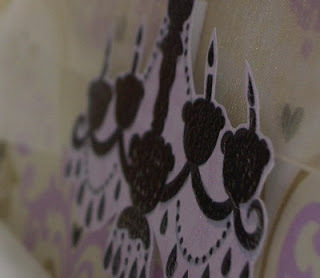 This is a Pink Petticoat image that I've embossed using an embossing pen and clear embossing powder and I'm quite happy with the result. So happy that I got carried away and forgot the sentiment, it's meant to be a 'New Home' card! "on the 31st of this month all the ghosties and ghoulies come out to play and I want to see all your wonderful bright, fiendish and scary creations." You have until 31st October to Get Funky and the winner will receive a £20 voucher to spend at Funky Hand. 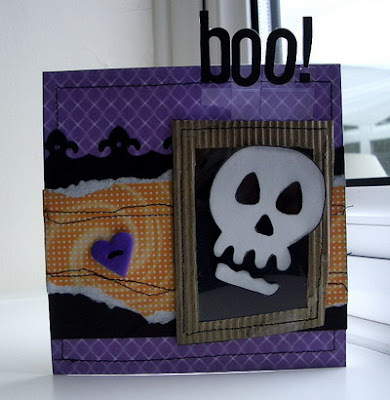 This was the first Halloween card I'd ever made surprised how much I enjoyed it, so much so I used one of my treasured heart shaped Fimo buttons from the lovely Jane, she's so talented, be sure to check out her blog she may even be giving away some buttons as we speak! 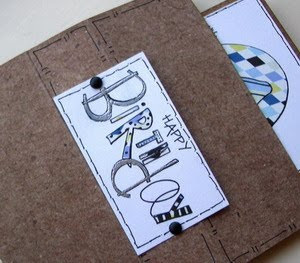 Be sure to check out all the DT creations on the Get Funky blog, lots of scary stuff there hope we've inspired you to join in the fun this month.